Following up on previous work demonstrating the involvement of the transcription factor forkhead box M1 (FOXM1) in the biology and outcome of a high-risk subset of newly diagnosed multiple myeloma (nMM), this study evaluated whether FOXM1 gene expression may be further upregulated upon tumor recurrence in patients with relapsed multiple myeloma (rMM). Also assessed was the hypothesis that increased levels of FOXM1 diminish the sensitivity of myeloma cells to commonly used myeloma drugs, such as the proteasome inhibitor bortezomib (Bz) and the DNA intercalator doxorubicin (Dox). FOXM1 message was evaluated in 88 paired myeloma samples from patients with nMM and rMM, using gene expression microarrays as measurement tool. Sources of differential gene expression were identified and outlier analyses were performed using statistical methods. Two independent human myeloma cell lines (HMCLs) containing normal levels of FOXM1 (FOXM1N) or elevated levels of lentivirus-encoded FOXM1 (FOXM1Hi) were employed to determine FOXM1-dependent changes in cell proliferation, survival, efflux-pump activity, and drug sensitivity. Levels of retinoblastoma (Rb) protein were determined with the assistance of Western blotting. Upregulation of FOXM1 occurred in 61 of 88 (69%) patients with rMM, including 4 patients that exhibited > 20-fold elevated expression peaks. Increased FOXM1 levels in FOXM1Hi myeloma cells caused partial resistance to Bz (1.9–5.6 fold) and Dox (1.5–2.9 fold) in vitro, using FOXM1N myeloma as control. Reduced sensitivity of FOXM1Hi cells to Bz was confirmed in vivo using myeloma-in-mouse xenografts. FOXM1-dependent regulation of total and phosphorylated Rb agreed with a working model of myeloma suggesting that FOXM1 governs both chromosomal instability (CIN) and E2F-dependent proliferation, using a mechanism that involves interaction with NIMA related kinase 2 (NEK2) and cyclin dependent kinase 6 (CDK6), respectively. These findings enhanced our understanding of the emerging FOXM1 genetic network in myeloma and provided preclinical support for the therapeutic targeting of the FOXM1-NEK2 and CDK4/6-Rb-E2F pathways using small-drug CDK and NEK2 inhibitors. Clinical research is warranted to assess whether this approach may overcome drug resistance in FOXM1Hi myeloma and, thereby, improve the outcome of patients in which the transcription factor is expressed at high levels. With an estimated 30 thousand cases annually, newly diagnosed multiple myeloma (nMM) is the second most common blood cancer in the United States . MM is a neoplasm of immunoglobulin-producing plasma cells that reside in the bone marrow. Quintessential disease manifestations include serum M-spikes (paraproteins), lytic bone lesions, hypercalcemia and renal insufficiency . Owing to both newly developed myeloma drugs and the continuous refinement of therapeutic regimens that combine high-dose chemotherapy (HDT) with autologous hematopoietic stem cell transplantation (ASCT), the outcome for patients with nMM has significantly improved in recent years  – making it possible, at long last, to cure a tangible number of patients . However, in the great majority of cases, following a period of successful therapy, myeloma relapses as a drug-refractory aggressive disease that leaves few, if any, therapeutic options. The unmet medical need of relapsed multiple myeloma (rMM) warrants dedicated research to enhance our understanding of the underlying pathways and identify new molecular targets for the design and testing of novel treatment approaches. Although potent myeloma treatments, particularly proteasome inhibitors (PIs) and immunomodulatory drugs (IMiDs), have given the means to durable responses and prolonged survival of patients with myeloma, the inevitable relapse with drug-resistant disease is all too common. The root cause of acquired drug resistance in rMM is poorly elucidated, yet increasing evidence points to the involvement of a complex population dynamic of neoplastic myeloma growth  characterized by competition of co-existing tumor cell clones that eventually give rise to a dominant treatment-refractory clone able to thrive under conditions of strong drug-induced selective pressure. Genetic and genomic studies have shown that the evolutionary process sketched out above is driven by point mutations in drug response and other genes , copy number alterations that can abrogate tumor suppressor pathways  and changes in the epigenome that can reshape phenotypic and functional features of myeloma cells by virtue of affecting gene expression . Another driver of the intricate pathophysiology of rMM is the bone marrow microenvironment, which provides tumor-promoting interactions with resident bone cells and the innate and adaptive immune system . Increased cancer stemness may also be involved , the annoying elusiveness of bona fide myeloma stem cells notwithstanding. Heartened by recent findings on the key role of the transcription factor, forkhead box M1 (FOXM1), in the genetic network of myeloma , we here continue with previous studies on the impact of FOXM1 in nMM  and rMM  and show that acquisition of drug resistance may be an important mechanism by which FOXM1 facilitates disease progression and relapse. Upregulation of FOXM1 rendered human myeloma cell lines (HMCLs) in continuous in vitro culture partially resistant to the PI, bortezomib (Bz), and the DNA intercalator, doxorubicin (Dox). In agreement with that was the in vivo result that enforced expression of FOXM1 in a HMCL designated CAG reduced the sensitivity of myeloma-in-mouse xenografts to Bz. 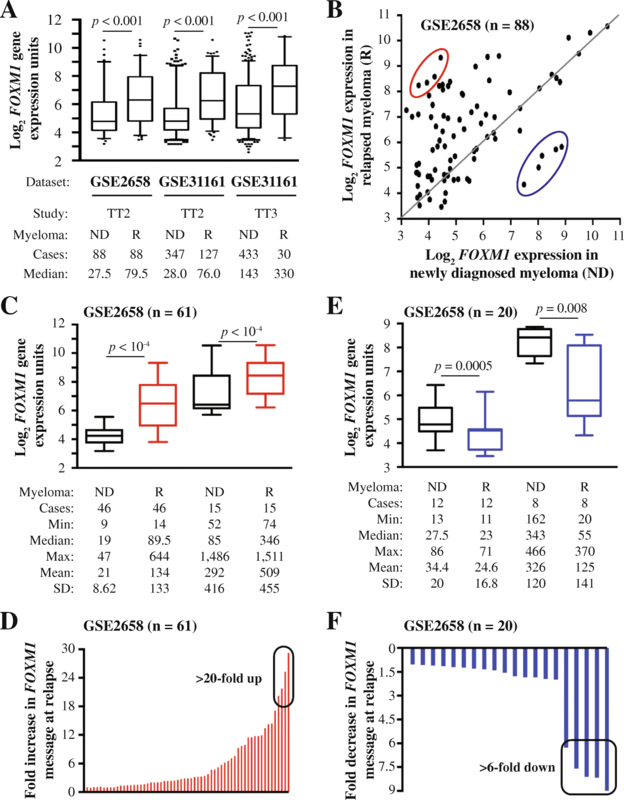 We also provide evidence that FOXM1, presumably by virtue of its interaction with the retinoblastoma (Rb) cell cycle progression and tumor suppressor protein, promotes β-galactosidase (β-gal+) activity in myeloma – the classic Rb-regulated phenotype of cellular senescence that is mechanistically linked to relapsed cancer by means of acquired drug resistance, cancer dormancy and cancer stemness . The result of this study adds strength to the contention that the therapeutic targeting of FOXM1 may benefit patients with myeloma in which the transcription factor is strongly expressed. Levels of FOXM1 mRNA in myeloma cells were determined using Affymetrix U133Plus 2.0 microarrays (Santa Clara, CA) as previously described [15, 16]. Statistical analysis of microarray data relied on GCOS1.1 software (Affymetrix, Santa Clara, CA). Patients at UAMS were treated using the Total Therapy 2 regimen, the backbone of which is high-dose melphalan therapy (HDT) and autologous stem cell transplantation (ASCT). Half of the patients received thalidomide both during intensive therapy and as maintenance therapy. The therapeutic approach to relapsing disease was not uniform and depended mainly on the time to relapse, the pace of relapse (slow versus aggressive), the presence or absence of organ dysfunction, and the patient’s overall health status, physical and mental fitness and treatment preference. Four IgA-producing HMCLs, designated CAG, XG1, H929 and ARP1, were included in this study. The identity of the cell lines was validated as previously described , using chromosomal translocation status and gene expression spikes as main parameters. Cells were propagated in vitro at 37 °C and 5% CO2 using RPMI1640 cell culture medium (Gibco) supplemented with 10% heat-inactivated fetal bovine serum (Atlanta Biologicals) and antibiotics (100 units/mL penicillin and 100 μg/mL streptomycin, Sigma). In some experiments, CAG and XG1 cells over-expressing FOXM1 (FOXM1Hi) were compared to cells containing normal amounts of FOXM1 (FOXM1N) . In other experiments, H929 and ARP1 cells in which FOXM1 expression had been knocked down using shRNA (FOXM1Lo) were compared to parental FOXM1N cells . Chemicals including myeloma drugs were purchased from Sigma (doxorubicin [Dox], thiostreptone [TS]), Millennium Pharmaceuticals (bortezomib [Bz]), or Invitrogen (propidium iodide, RNase A). For cell cycle analysis, cells were fixed in ice-cold ethanol (1 h, 4 °C), washed in PBS, re-suspended in propidium iodide (PI) solution (40 μg/ml, 3 h, 4 °C) supplemented with 50 μl RNase A (10 μg/ml), and evaluated by flow cytometry using a FACScan (Becton Dickinson, San Jose, CA). For determination of clonogenicity, 104 myeloma cells were seeded in soft-agar plates (0.5 ml RPMI1640 supplemented with 0.33% agar and 10% FBS) and grown for 2 weeks at 37 °C and 5% CO2 – in some cases exposed, during week 2, to myeloma drugs. Myeloma clones, defined as tight aggregates of ≥40 tumor cells, were enumerated on digital images of soft-agar plates analyzed with the help of Image J. For measurement of proliferation and viability, cells were counted using a hemocytometer and evaluated for exclusion of trypan blue (0.4% dye in PBS, pH 7.3), respectively. For determination of apoptosis, the flow-cytometric Annexin V APC assay (eBioscience, San Diego, CA) was used according to the manufacturer’s instructions. For determination of drug-efflux capacity, the flow-cytometric eFluxx-ID™ multidrug resistance assay was employed. MCF7 human breast cancer cells were included as benchmark. For determination of senescence-associated β-galactosidase (β-gal) activity, a kit from Cell Signaling Technology (Cat# 9860) was used. Briefly, cells were fixed (15 min), washed (PBS) and incubated in β-gal staining solution overnight at 37 °C. Protein levels were determined by Western analysis using antibodies to FOXM1, Rb and pRb obtained from Santa Cruz Biotechnology (FOXM1, sc-500) or Cell Signaling Technology (Rb, 9309; pRb, 8515). Cells were lysed with assistance of the Mammalian Cell Extraction kit (K269–500) from Biovision, Milpitas, CA. 10-μg samples of protein were fractionated on 4–12% SDS-PAGE gels, followed by transfer to nitrocellulose membranes blocked with 5% non-fat dry milk in Tris-buffered saline containing 0.05% Tween-20. Incubation with primary antibodies occurred overnight at 4 °C. Proteins were visualized using HRP-conjugated secondary antibody and SuperSignal West Pico (Pierce, Rockford, IL). Membranes were subsequently stripped and re-probed for β-actin (Santa Cruz Biotechnology, sc-47778), which served as loading control. To compare the drug response in CAG myeloma cells expressing normal and elevated FOXM1 levels, respectively, 2 × 106 FOXM1N and FOXM1Hi cells were injected subcutaneously (SC) into the right or left flank of NSG mice (Jackson Laboratory, Bar Harbor, Maine). Viability of FOXM1N and FOXM1Hi cells was comparable (≥90%). Seven days later, one group of mice was treated with bortezomib (1 mg/kg) administered intraperitoneally (IP) twice weekly. Another group of mice, designated untreated control, was injected with drug vehicle, normal saline (0.9% sodium chloride). In all cases, tumor growth was measured using a pair of calipers. Mice were sacrificed for humane reasons using CO2 asphyxiation when tumors reached 20 mm in diameter. All studies were approved under protocol 1301010 of the Institutional Animal Care and Use Committee of the University of Iowa. Two-tailed Student’s t-test was used to compare two experimental groups, employing parametric or non-parametric methods in case data were normally distributed or not, respectively. One-way analysis of variance (ANOVA) was used to evaluate more than two groups. To compare drug responses in mice, linear regression and AUC (area under curve) determination were used. For all analyses, the GraphPad Prism 7 software package (La Jolla, CA) was employed and p ≤ 0.05 was considered significant. Using the University of Arkansas for Medical Science (UAMS) Total Therapy 2 (TT2) dataset (GSE2658) as discovery tool, we recently reported that upregulation of FOXM1 was a common feature of patients with rMM . Here we confirm this finding with the help of an updated TT2 dataset that includes 127 patients with rMM and a related TT3 dataset that includes 30 patients with rMM – both available at GSE31161 (Fig. 1a). The increase in median FOXM1 mRNA levels in these datasets, 2.7-fold in case of TT2 (76/28) and 2.3-fold in case of TT3 (330/143), was very similar to the one observed in the original TT2 dataset (2.89-fold; 79.5/27.5). Furthermore, in all 3 datasets, mean FOXM1 expression at relapse was significantly elevated (p = 10− 3) compared to baseline. Next, we went back to the TT2 / GSE2658 dataset, presented in dot plot format in Fig. 1b, to visualize the two expression values, ND vs R, for each patient. Upregulation of FOXM1 mRNA at relapse was seen in more than two thirds of patients (61 of 88, 69%; indicated by dots above the diagonal line), whereas gene message was down in 20 (23%) patients (dots below the line) and unchanged in 7 (8%) patients (dots on the line). The magnitude of the elevation at relapse (~ 2.6-fold; 226/87.8) was similar to the decline (~ 2.3-fold; 151/64.6) using mean expression levels for comparison. These results indicated that the overall increase of FOXM1 message at relapse was caused by the preponderance of myelomas with elevated gene expression (69%), not by the circumstance that the magnitude of elevation exceeded that of reduction. To analyze the 61 myelomas that harbored elevated FOXM1 at relapse in greater depth, we partitioned these cases in two arbitrary groups defined by median baseline expression levels of 19 microarray units (n = 46) and 85 units (n = 15), respectively, in newly diagnosed (ND) disease (Fig. 1c, black boxes with whiskers). The increase at relapse in the low expresser group was somewhat higher (4.7-fold, 89.5/19) than in the high expresser group (4.1-fold, 346/85). The difference was due, in no small measure, to four myelomas in the low expresser group that exhibited > 20-fold elevated expression peaks at relapse. This is indicated by a black ellipse in Fig. 1d. The analysis of tumors featuring reduced FOXM1 expression at relapse is depicted in Fig. 1e. Partitioning of the dataset (n = 20) in two groups with median baseline expression of 27.5 units (n = 12) and 343 units (n = 8) at the time of diagnosis (ND) demonstrated that the decrease in the high expresser group was more pronounced (6.2-fold, 343/55) than in the low expresser group (1.2-fold, 27.5/23; Fig. 1e). The difference could be attributed in large part to a subset of myelomas in the high expresser group (n = 5) that exhibited > 6-fold drops in gene expression at relapse (Fig. 1f, black ellipse). These findings led us to conclude that the pattern of FOXM1 expression in rMM is heterogeneous, with outliers in both directions contributing disproportionally to the relapse-dependent shift in gene expression. To confirm the findings presented in Fig. 1 with an independent method not relying on Affymetrix arrays, we used RT-PCR to analyze sequential ND and R CD138+ bone marrow tumor samples from 8 patients with myeloma undergoing HDT/ASCT therapy. Although the number of clinically confirmed relapses was low (n = 3), the increase in FOXM1 expression was impressive, up to 35-fold (Additional file 1: Figure S1). To assess the biological outcomes of elevated FOXM1 in MM, we relied on two HMCLs, XG1 and CAG, as experimental model system. The cells were manipulated to contain either elevated levels of FOXM1 (FOXM1Hi) or normal levels of gene message and protein (FOXM1N) due to transfection with a human FOXM1 (isoform C) expressing lentivirus or a non-coding “empty” lentivirus (used as control), respectively  (Fig. 2a). Flow cytometric determination of cell proliferation showed that upregulation of FOXM1 promotes cell cycle progression (Fig. 2b). FOXM1Hi CAG and XG1 cells exhibited 14 and 13% higher growth rates, respectively, compared to FOXM1N cells (compare columns labeled “Co”). Treatment of cells with the FOXM1-inhibiting thiazole antibiotic, thiostrepton (TS) , slowed the growth of both FOXM1Hi and FOXM1N cells. However, the low Hi-to-N ratio indicated that FOXM1Hi cells were more sensitive to TS than FOXM1N cells (columns labeled “TS”). Figure 2c depicts an example of the magnitude of TS-dependent growth inhibition of FOXM1Hi cells under conditions of higher drug concentration compared to panel B. The decrease in proliferation amounted to 72% (4.72/16.9) in case of CAG cells (left panel) and 76% (6.40/26.1) in case of XG1 cells (right panel). The results presented above were in line with genetic evidence gleaned from transcriptomic studies using microarrays, indicating that FOXM1 promotes myeloma proliferation. Thus, FOXM1 expression is positively correlated (Pearson’s r = 0.712, p < 10− 4) with myeloma cell proliferation in 244 Bz-treated patients available at GSE9782 , using the global gene expression-based proliferation index (GPI) of myeloma devised by Bergsagel et al. as proxy of actual tumor cell proliferation (Fig. 2d). Similarly, we recently reported  that FOXM1 message levels in nMM and rMM paralleled the GPI of developed by Hose and his associates . Next, we used eFluxx-ID Gold MDR analysis to demonstrate that upregulation of FOXM1 results in enhanced ABC-transporter efflux-pump activity in myeloma (Fig. 2d). This finding suggested that FOXM1-dependent promotion of cell cycle progression in myeloma may facilitate drug resistance by means of enhanced outflow of myeloma drugs. Because recurrent cancers including rMM may acquire therapy resistance due to alterations in biological pathways in which FOXM1 is involved , we wondered whether upregulation of FOXM1 may decrease the sensitivity of myeloma cells to widely used myeloma drugs, such as bortezomib (Bz) and doxorubicin (Dox). We found that enforced expression of FOXM1 renders myeloma partially resistant to both drugs, as evidenced by half-maximal inhibitory concentrations (IC50) that, in case of Bz, were 5.6-fold (CAG) and 1.9-fold (XG1) higher in FOXM1Hi than FOXM1N cells (Fig. 3a, left). In case of Dox, they were 2.9-fold (CAG) and 1.5-fold (XG1) higher (Fig. 3a, right). Flow cytometric measurements of annexin V, a marker of apoptosis, were in agreement with these results as FOXM1Hi cells invariably exhibited less drug-induced death than FOXM1N cells did. For example, there was a 2.7-fold difference in CAG cells treated with Bz (23% vs. 63%) and a 1.5-fold difference in XG1 cells treated with Dox (49% vs. 72%, Fig. 3b). Determination of myeloma growth in soft agar demonstrated the clonogenic advantage of FOXM1Hi cells. One example, depicted in Fig. 3c, shows that FOXM1Hi CAG cells treated with 2 nM Bz or left untreated produced ~ 50% (right panels) or ~ 25% more colonies (left panels), respectively, than FOXM1N controls. XG1 cells demonstrated greater differences based on Hi-to-N ratios (Fig. 3d), suggesting that FOXM1 protects the clonogenic growth of these cells under conditions of selective drug pressure even more effectively than that of CAG cells. These findings were of interest in light of published reports that suppression of FOXM1 may sensitize human cancer to killing by genotoxic drugs . To complement the in vitro findings described above with in vivo data, we determined whether upregulation of FOXM1 results in decreased susceptibility of myeloma to proteasome inhibition (PI). We used human-in-mouse myeloma xenografts treated with Bz or left untreated (control) as model system. FOXM1Hi and FOXM1N CAG cells were transferred under the skin of the left and right flank of NSG mice (n = 10), respectively. Treatment of 5 tumor-bearing hosts using daily IP injections of Bz commenced 7 days later. Five tumor-bearing hosts left untreated were used as controls (Fig. 4a). Tumor diameters were measured in 4-day intervals to compare xenograft growth rates. FOXM1Hi tumors harvested on day 30 (study endpoint) were larger than their FOXM1N counterparts in both the Bz treatment arm (15.2 ± 1.97 mm vs 10.4 ± 0.771 mm) and the control arm (19.0 ± 1.31 mm vs 14.0 ± 1.73 mm) arm (Fig. 4b). This was consistent with FOXM1’s growth-promoting activity described above. However, in terms of sensitivity to PI, FOXM1Hi tumors were slightly less responsive (by 10%) than their FOXM1N counterparts on the contralateral side of the same host. Specifically, Bz-dependent growth inhibition of FOXM1Hi tumors at study endpoint (1.32 ± 0.434 g in treated mice vs. 2.40 ± 0.647 g in mice left untreated) amounted to 45%, whereas that of FOXM1N tumors (0.692 ± 0.217 g treated vs 1.54 ± 0.543 g untreated) amounted to 55% (Fig. 4c). This result, however modest it might be, was consistent with published findings that lowering FOXM1 in human cancer cells leads to enhanced PI-induced killing . Our recent work has implicated the cyclin-dependent kinase 6 (CDK6) / retinoblastoma (Rb) axis in the mechanism by which FOXM1 promotes myeloma . To confirm the co-regulation of FOXM1 protein levels and the tumor suppressor, Rb, in myeloma, we performed triplicate Western analyses of paired FOXM1Hi and FOXM1N tumors (Fig. 5a, left). For sake of comparison to FOXM1Hi, we included FOXM1Lo samples from H929 and ARP1 HMCL cells, in which FOXM1 had been knocked down using lentivirus-delivered RNA interference (Fig. 5a, right). 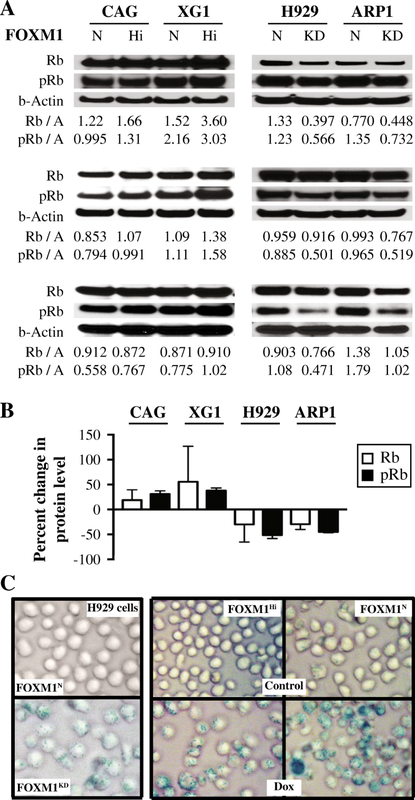 Densitometric analysis of Western blots showed that total Rb and phosphorylated Rb (pRb) were increased in FOXM1Hi cells by 20–40%, with somewhat higher levels seen in XG1 than CAG cells (Fig. 5b, left). Conversely, Rb and pRb were decreased in FOXM1Lo cells (~ 30 to 50%), with the loss of the latter somewhat exceeding that of the former (Fig. 5b, right). Inspired by a large body of evidence that connects the Rb-governed cell fate decision of senescence with important pathways of cancer relapse such as drug resistance, tumor dormancy and tumor stemness , we determined whether myeloma cells might express the classic senescence-associated phenotype of β-galactosidase in a FOXM1-dependent manner. Fig. 5c, left shows that FOXM1 knockdown sufficed to induce β-gal activity in myeloma. Furthermore, treatment of cells using Dox caused higher β-gal+ scores in FOXM1N than FOXM1Hi cells (Fig. 5c, right). These findings were consistent with published reports on the role of FOXM1 in suppressing cellular senescence in a variety of solid and liquid neoplasms . The main finding of this study is experimental evidence for a role of FOXM1 in advanced myeloma. The new results implicating FOXM1 in drug-resistant disease relapse and the β-gal+ phenotype of cellular senescence agree with the well-known pleiotropic function of the transcription factor in cancer cell biology . In both solid and liquid cancers, FOXM1 governs a wide spectrum of biological processes, including cell cycle progression, DNA damage repair, self-renewal of stem cells  and senescence  – all involved in tumor progression and the response of malignancies to cytostatic and targeted treatments . In regard to diverse biological functions attributable to FOXM1 in myeloma, the transcription factor seems to resemble well-established “master” transcription factors of myeloma, such as interferon regulatory factor 4 or IRF4 (a.k.a. MUM1)  and the myelocytomatosis oncoprotein MYC . To further put FOXM1’s role in myeloma in perspective, it is helpful to recognize that this particular member of the large forkhead box family of proteins is critically involved in the development and outcome of other B-lineage neoplasms; e.g., acute lymphoblastic leukemia , diffuse large cell lymphoma , chronic lymphocytic leukemia  and follicular lymphoma . What is more, an overarching impact of FOXM1 on cancer as a whole has been suggested by a recent pan-cancer meta-analysis of approximately 18 thousand gene expression signatures , which identified the FOXM1 regulatory network as a major predictor of adverse outcomes across 39 solid and hematologic malignancies including MM. 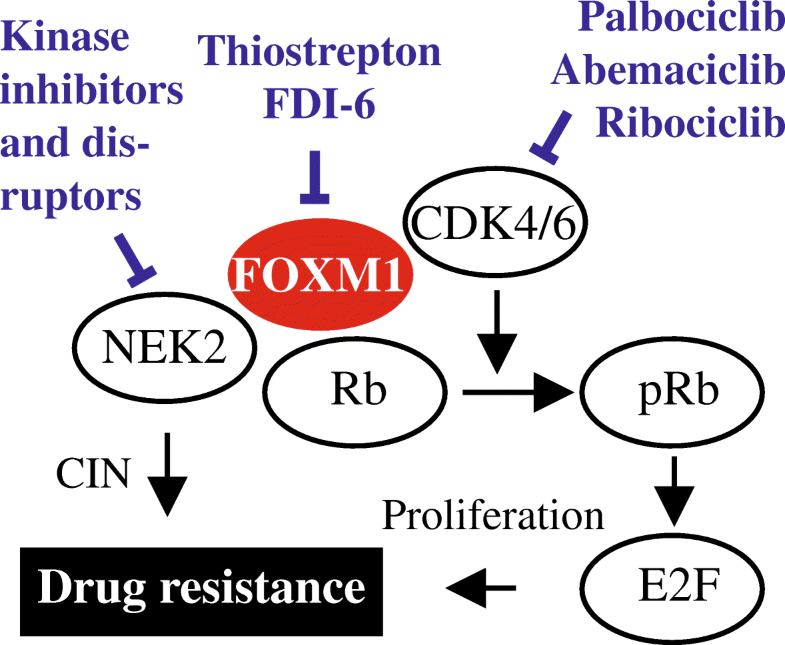 Although the molecular mechanism by which FOXM1 promotes drug resistance in myeloma has not yet been elucidated, FOXM1-dependent increases in cell proliferation, NEK2 (NIMA related kinase 2)-dependent CIN (chromosomal instability) and ABC-transporter drug-pump activity may be involved . The latter has been repeatedly implicated in drug-resistant solid cancers; e.g., in retinoblastoma , bladder cancer  and colorectal cancer , in which the heightened drug-efflux activity could be functionally linked to FOXM1-dependent upregulation of ABCC4, ABCG2 and ABCC10, respectively. Also playing a role may be other pathways of drug resistance that operate in solid tumors ; e.g., inhibition of ubiquitination-dependent FOXM1 degradation via interacting proteins, such as OTUB1 (OTU deubiquitinase, ubiquitin aldehyde binding 1) ; crosstalk of FOXM1 with other cellular signal transduction pathways, such as HGF / Met (hepatocyte growth factor / Met proto-oncogene, receptor tyrosine kinase)  and AKT (AKT serine / threonine kinase 1) ; and metabolic changes that effect increased oxidative defense capacity, as seen in radio-resistant head and neck squamous cell carcinoma . Targeting the interactions and pathways described above – perhaps in conjunction with targeting FOXM1 directly using established  or emerging  small-drug inhibitors – may afford the re-sensitization of relapsed FOXM1High myeloma to Bz and other drugs that were effective at earlier stages of myeloma therapy. A variety of molecularly targeted chemo-sensitization approaches of this sort are pursued in myeloma  – all attempting to build on findings in B-ALL that demonstrate that drug resistance in malignant B lymphocytes may be overcome by suppression of FOXM1 . Several limitations of our study exist. First among these is the need to confirm the findings on FOXM1-dependent drug resistance in primary tumor cells. Sequential nMM → rMM samples of fractionated malignant bone marrow plasma cells obtained from patients with new and relapsed myeloma may lend themselves to that end. In this context, we should also acknowledge that our xenograft approach for testing the Bz response in vivo was not a true study of cancer relapse; instead, it merely assessed drug-dependent growth inhibition in vivo. Genetically engineered mouse models of human myeloma – in which spontaneously arising tumors can be put into remission using clinically relevant myeloma drugs, and the mice can be kept alive until relapsed tumors require salvage treatment – may mimic the situation of patients with rMM more accurately. Two validated mouse models, designated Vκ-Myc and IL6iMyc, are available for that purpose [47–50]. Another limitation of this study concerns the involvement of cellular senescence in drug-resistant myeloma. Although β-gal activity is a well-established phenotype of cellular senescence in many types of cancer including MM [51, 52], additional research is warranted to demonstrate the mechanistic link to the FOXM1-Rb pathway. Mechanisms of FOXM1-dependent senescence elucidated in neoplasms other than myeloma  include enhancement of Bmi-1 expression, as seen in the NIH3T3 model ; overexpression of miR-370, observed in AML ; and inhibition of the CDK4/6-FOXM1 axis by genetic means, such as enforced expression of miR-506 in ovarian cancer , or pharmacologic means, such as small-drug CDK inhibition in neuroblastoma . We now know that FOXM1 is a high-risk myeloma gene in newly diagnosed patients  that undergoes further upregulation in the majority of cases upon tumor relapse . FOXM1’s interaction in myeloma cells with NEK2 (NIMA-related kinase 2) and the CDK4/6-Rb-E2F axis [12, 13] is of interest from a therapeutic viewpoint because CDK inhibition may be effective in myeloma [12, 58–60]. Moreover, NEK2 – a well-established transcriptional target of FOXM1 in cancer [61, 62] that has been shown to drive drug resistance in myeloma and other malignancies [63–65] – can be targeted with the help of small compounds that inhibit kinase activity  or trigger target degradation indirectly by means of a mechanism that involves the disruption of NEK2 binding to the kinetochore complex component NDC80 / HEC1 . Figure 6 depicts the emerging FOXM1 genetic network in myeloma. Small-drug inhibitors targeting this network may overcome drug resistance in tumors in which the transcription factor is highly expressed. Chunyan Gu and Xuefang Jing are co-first authors. Ye Yang and Siegfried Janz are co-senior authors. Expert technical assistance provided by staff of The University of Iowa Laboratory Animal Care and Resources Facility, Central Microscopy Research Facility, and Flow Cytometry and Genomics Cores is gratefully acknowledged. This work was supported by grants from the National Natural Science Foundation of China (NSFC), (81500166, 81600177, 81770220 and 81670200 to YY and CG and by grants from the Natural Science Foundation of Jiangsu Province, BK20160048 to YY and BK20161041 to CG. This work was also supported by NIH R01CA152105 and grants from the Multiple Myeloma Research Foundation, International Myeloma Foundation and American Society of Hematology (ASH) Bridge Funding Program (all to FZ). Additional assistance was provided by NCI Core Grant P30CA086862 in support of The University of Iowa Holden Comprehensive Cancer Center. Support from ASH’s Bridge Grant Program and NIH grants R21CA187388 and R01CA151354 (all to SJ) is also gratefully acknowledged. Please contact the co-senior authors with requests for data, reagents, constructs, and materials. CG and XJ carried out bench work and performed in vitro and in vivo studies using myeloma cells. CH and R S carried out histopathologic and statistical analyses. FZ and GT evaluated gene expression and clinical outcome data and provided expertise on myeloma treatment. YY and S J conceived, designed and coordinated the study and drafted the manuscript. All authors read, commented on, and approved the final manuscript. The University of Iowa Institutional Review Board approved the study, including the use of de-identified patient tissue samples. All patients provided written informed consent and their anonymity was maintained throughout the study.